Trevose Horticultural Society - Times Publishing Newspapers, Inc. The Trevose Horticultural Society (THS) recently celebrated 95 years as a presence in the Bucks County area and surrounding communities. A member of the National Garden Clubs, Inc. (NGC) and the Garden Club Federation of PA (GCFP), THS’ most ambitious endeavor is staging its annual Standard Flower Show. St. Ephrem’s Catholic Church, 5400 Hulmeville Road in Bensalem will host this year’s show, “Birds of a Feather” on Friday and Saturday, August 16th and 17th. This event offers local competitors an expansive schedule that includes artistic design classes, 135 horticultural classes and educational exhibits. To encourage entries in the show’s Youth Award classes, a special class will be offered to students in the Bensalem Summer Art Program at the Bensalem Senior Center. Market table funds support annual scholarships awarded to deserving tri-state college students majoring in horticultural-related studies. 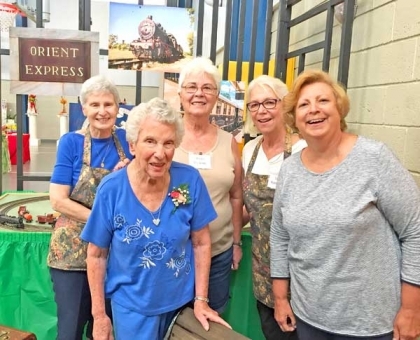 In addition to volunteering at the Pennsylvania Horticultural Society (PHS) Philadelphia Flower Show, members also exhibit and merit ribbons in the forced bulb classes, horticulture displays and design classes. In summer 2018, members donated over 900 pounds of homegrown produce to the Warminster food bank. Residents at the Delaware Valley Veteran’s Home on Southampton Road in Northeast Philadelphia are recipients of greeting cards, hand-knitted lap robes, shawls and Afghans. In May 2018 the Society had an active role at the National Garden Clubs Inc. annual convention at the Loews Hotel in Philadelphia. Monthly meetings include a program featuring a variety of garden-related, environmental or design topics, a brief business meeting, a “Little Show” and refreshments. An informative monthly newsletter is included in the annual dues. THS meets every third Tuesday (except January) at 7:00pm at the Bensalem Senior Center, 1850 Byberry Road, Bensalem. Membership is open to all interested gardeners. Guests are welcome; a donation of $4 is requested. For information, contact 215-441-5884 or 856-866-9163.